Before you start your blog, you have to name it. Even if you’re just creating a blog to share your own personal brand or hobby, make sure you put some thought into the naming process. No matter what kind of content you want to create, finding the right name for your blog requires some consideration. You want to name your blog based on a thorough understanding of your audience, competitors, and brand followed by a brainstorming session. 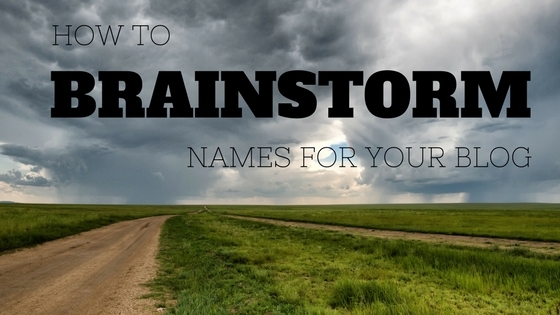 Here are a few things to keep in mind as you brainstorm name ideas for your new blog! Who is your audience? Defining the demographics, preferences, and purchasing habits of your audience will help you connect with them through your blog. It will also give you an idea of what blog names might speak to them more than others. For example, you’re not going to call your blog “Lizard Lovers Blog” if your target audience includes snake enthusiasts as well as lizard enthusiasts. How will your blog look and feel? If you’re trying to demonstrate that you’re a thought leader or good source of factual information on lizards and snakes, you may keep your tone a little more professional and polished. Whereas if your blog was about the cute things your pet lizard does, then your tone will likely be more light-hearted. And, if you’re selling products popular with snake and lizard enthusiasts such as supplies or merchandise, you want your blog to match the voice and tone of your business. Is your brand casual and friendly or serious and informational or maybe even a combination? Let however you decide to market your blog and your brand guide you during the naming process. What kind of content will you share on your blog? Your content topics and writing style will help you determine which names are relevant. For example, you may not want to name your blog “Cute Pets 101” and then only post content about snakes and lizards. The name suggests that your blog content will include all pets and not everyone considers snakes and lizards cute so it’s a little misleading, which will hurt your SEO. Speaking of SEO, how searchable is your blog? You want your blog name to match your domain name and they should both be easy to remember. Naming your blog “Misrepresentation in the Media: Lizards and Snakes Suffer Due to Unfair and Inaccurate Portrayal Onscreen” won’t help with searchability. It’s too long and hard to remember. While a blog on the misrepresentation of snakes and lizards would be interesting, you don’t need to name it as if it were a college paper. Make it easily searchable online by coming up with a memorable name that’s easy to spell and matches up with your most common search queries and top ranking keywords. Before you have your heart set on the most perfect name for your new blog, make sure it’s available to purchase as a domain name. You can check domain name availability here. Once you understand your target audience, your blog goals, and how you want your blog to look and sound, it’s time to start brainstorming some blog name ideas. You can try a few of these methods to come up with a creative blog name. Check out a thesaurus or look up some words in different languages to get ideas. Instead of naming your blog “Snakes and Lizards”, you may find some compelling synonyms in a thesaurus or even Latin words that will give you a stand-out blog name. Feel free to make a reference to popular books and movies with your blog name. While “Chamber of Serpents” excludes lizards, “Nagini’s Favorite Blog” would make a fun tag line. Test out some word and name generators. They may not give you anything relevant, but even random words could inspire some new ideas for your blog name. Alliterations are fun and easy to remember. A blog name like “Lizards and Leviathans” is memorable and your audience can easily search for it. Finding the perfect name for your blog can be stressful so try to have fun with it! And, if all else fails, keep it simple. There’s nothing wrong with staying on brand and naming your blog “pair Networks Blog”.